We’d love your help. Let us know what’s wrong with this preview of The Dragon Slayer by Jaime Hernández. To ask other readers questions about The Dragon Slayer, please sign up. Hernandez presents three fairy tales from Latin America, done in graphic novel format, and aimed at middle-grade readers. Kudos to the author for making young girls the protagonists in the first two stories. The artwork is . . . serviceable . . . but nothing special. I would have preferred something a little more ornate and flowery. Three Latino folktales that are a lot of fun. They follow traditional patterns of three sons or daughters and repetition. The first two stories have a female hero. Both the front and end contain further information on the tales which puts them into historical and cultural context. Cute cartoon illustrations make this an overall great read. A diverse choice for the Bluebonnet books 2019-2020, but I felt some of the stories might be a bit much for 3rd graders. #weneeddiversebooks Overall I did enjoy it, but graphic novels aren’t my favorite by far. Interesting stories. I've never read any folktales from Latin America. The preface and end notes are very feminist focused. Really well done comic version of three Latin American folktales by Jamie Hernandez. My kids (5 & 9) both loved it and I did too. Even reads aloud well and there is some nice back matter. Highly recommended for ages 5-10. What a beautiful book. These three graphically-rendered, Latin American folktales are sure to delight both children and adults alike. I loved it. 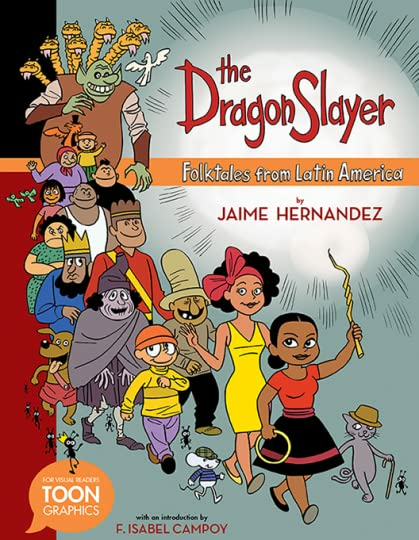 Hernandez, Jaime The Dragon Slayer: Folktales from Latin America, 40 pages. GRAPHIC NOVEL Toon Graphics (Candlewick), 2017. $17. Content: G.
Three different folktales are included in this graphic novel. The first is called The Dragon Slayer and is about a young girl who uses a magical truth wand to help the boy she loves from being sacrificed to a dragon. 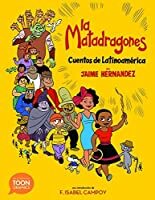 The second story is Martina Martinez and Perez the Mouse about a woman who attracts all sorts of animals, but finds her true love in a rat, bu Hernandez, Jaime The Dragon Slayer: Folktales from Latin America, 40 pages. GRAPHIC NOVEL Toon Graphics (Candlewick), 2017. $17. Content: G.
Three different folktales are included in this graphic novel. The first is called The Dragon Slayer and is about a young girl who uses a magical truth wand to help the boy she loves from being sacrificed to a dragon. The second story is Martina Martinez and Perez the Mouse about a woman who attracts all sorts of animals, but finds her true love in a rat, but he falls into a soup pot and a wise woman from town has to save him. The third story is Tup and the Aunts about a boy who convinces a colony of aunts to do all of his chores of planting a corn field. Although the three stories are completely different they are all entertaining with different morals to the story. The illustrations are cartoon-ish but well done. I enjoyed these stories and there are author’s notes at the beginning and the end that explain why we have folktales and more history on the three folktales in this book. I would imagine this has a limited audience and would probably most effectively be used by a Literature teacher in a Folktales unit. EL (K-3), EL – OPTIONAL. Reviewer, C. Peterson. "The Dragon Slayer" is a collection of three folktales from Latin America. I had never heard of any of these tales. As someone who likes folktales and is a Spanish teacher, I felt that reading these and familiarizing myself with some of the archetypes would be important for my personal and professional edification. This is the English version of the tales, but finding out later that there is a Spanish version I think I would've preferred to read that version. Regardless of the language, I appreci "The Dragon Slayer" is a collection of three folktales from Latin America. I had never heard of any of these tales. As someone who likes folktales and is a Spanish teacher, I felt that reading these and familiarizing myself with some of the archetypes would be important for my personal and professional edification. This is the English version of the tales, but finding out later that there is a Spanish version I think I would've preferred to read that version. Regardless of the language, I appreciated the tales and the messages they convey. There's tales that discuss women's roles in society, class discrimination, work ethic, and even humans marrying animals (I'm still not sure what to do with that one). I preferred the "Dragonslayer" tale. Part of it was because there's a quest and another part because there is a lot of symbolism. Folktales fascinate me because if you read tales from different cultures you begin to see a common thread between them all. Of course, there's going to be unique characteristics that are representative of unique cultures, but there's also common elements that, to me show a common human connection. The hardest tale for me to understand what the message was is "Sr. Ratoncito." It's the tale of a mouse who marries a girl because he notices the bow in her hair. Apparently in this world humans and animals intermarry and it's not big deal. At one point the mouse falls into a soup and no knows what to do until an aunt comes and plucks him out of the soup and revives him. If you know what the moral, you're way ahead of me. Three, young-person-friendly, Latin American folks tales written, drawn, and adapted by comics legend Jaime Hernandez. The eponymous first story is passable, but nothing exceptional. It’s a mostly predictable story about a poor servant woman marrying a prince after slaying a dragon. The last two stories, however, are outstanding. One is a fun morality tale about a young woman whose husband (a rat) falls into a pot of soup. She mourns his loss and spreads her sadness to others. In case you don’t a Three, young-person-friendly, Latin American folks tales written, drawn, and adapted by comics legend Jaime Hernandez. I especially love the last story. I’m a big fan of children’s stories in which immoral behavior is rewarded, and wow does this little spit get rewarded for his immorality! The story is a riff on some of the great trickster folk tales. Again, I won’t spoil it for those who don’t already know the story, but the main character—the youngest of three brothers—is pathologically lazy, but he is also heroically savvy about preserving his laziness. This is a really delightful collection of three of the most believed stories in Hispanic/Latinx culture. I was really nostalgic for the art style, having been made to watch Muzzy the clock-eating alien as a child, and the tales were warm and familiar. 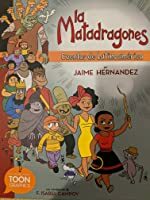 It’s also really awesome to have a children’s book that really shows the diversity of Latin America and clearly as well as vibrantly communicates the importance of ingenuity, determination, generosity, love, loyalty, and not waiting for some hero b This is a really delightful collection of three of the most believed stories in Hispanic/Latinx culture. I was really nostalgic for the art style, having been made to watch Muzzy the clock-eating alien as a child, and the tales were warm and familiar. It’s also really awesome to have a children’s book that really shows the diversity of Latin America and clearly as well as vibrantly communicates the importance of ingenuity, determination, generosity, love, loyalty, and not waiting for some hero but becoming your own. Also Jaime Hernandez emphasizes the importance of nurturing the strength of women and young girls and cultivating their sense of independence. He also sets out to highlight the tradition of celebrating these women in Latinx and Hispanic culture which is a much needed message, counter to what many of us are taught to believe about Latinx/Hispanic culture in the US and elsewhere. Eisner-award winner Jaime Hernandez has taken 3 short tales that feature strong women from Latino folk literature and retells their stories in graphic form. The stories included are "The Dragon Slayer", "Martina Martinez and Perez the Mouse", and "Tup and the Ants". A wonderful balance of words and images is achieved in this TOON book. Hernandez's digitally colored India ink images are simple, yet effective. The artwork is clear and fresh, reflecting their Latino origins. There is a timeless qual Eisner-award winner Jaime Hernandez has taken 3 short tales that feature strong women from Latino folk literature and retells their stories in graphic form. The stories included are "The Dragon Slayer", "Martina Martinez and Perez the Mouse", and "Tup and the Ants". A wonderful balance of words and images is achieved in this TOON book. Hernandez's digitally colored India ink images are simple, yet effective. The artwork is clear and fresh, reflecting their Latino origins. There is a timeless quality to them, with modern clothing and hair matched with traditional culture and technology. An introduction by F. Isabel Capoy puts Hernandez's work in perspective. Backmatter includes notes about each of the tales told, bios about the Hernandez and authors of the source books for the tales, and a bibliography for more tales. I love folktales. It’s an easy way to teach people important lessons and pass down important values and traditions. 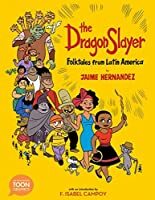 I chose “The Dragon Slayer” because I wanted to see how some of these lessons translated into a Juvenile fiction format, and I was curious about Latin American folktales. The artwork by Jaime Hernandez is expressive and fun. I’m not sure that young readers would understand the meanings behind the stories, though. Even as an adult, I was a little bit confused by a couple of them. Tha I love folktales. It’s an easy way to teach people important lessons and pass down important values and traditions. I chose “The Dragon Slayer” because I wanted to see how some of these lessons translated into a Juvenile fiction format, and I was curious about Latin American folktales. The artwork by Jaime Hernandez is expressive and fun. I’m not sure that young readers would understand the meanings behind the stories, though. Even as an adult, I was a little bit confused by a couple of them. Thankfully, they include further information about the folktales and the messages behind them in the back of the book. My only complaint: I wish it was longer! I want a larger collection of stories! In the end, it was meant for J readers, so I understand the decision to keep the length shorter. A collection of three familiar folktales, with a modern artistic twist, told in graphic novel form. The stories are told in straight forward language, which is good for upper grade readers reading a little below grade level. The illustrations are colorful, and show lots of emotions. My favorite tale was, "The Dragon Slayer,"a classic tale where a girl is tricked by her jealous sisters, but uses kindness, wits, and valor to overcome their trickery and triumph in the end. At the end of the book the A collection of three familiar folktales, with a modern artistic twist, told in graphic novel form. The stories are told in straight forward language, which is good for upper grade readers reading a little below grade level. The illustrations are colorful, and show lots of emotions. My favorite tale was, "The Dragon Slayer,"a classic tale where a girl is tricked by her jealous sisters, but uses kindness, wits, and valor to overcome their trickery and triumph in the end. The dragon slayer : folktales from Latin America was a quick and fun way to read traditional folktales. The graphic illustrations from Jaime Hernández, whom I love and worship from Love & Rockets, really brought these folktales to life. There are only three tales but all with obvious themes and/or lessons to learn. I cannot wait to get a copy for my third grade classroom and for my home library for my own kids to enjoy. I love the toon books series, Mouly's crew of artists always knock it out of the park, and this is no exception! Jaime Hernandez retells three delightful folktales and, in the back matter, discusses how Latin American folktales celebrate strong women and teach practical and moral lessons. His art is as lovely as usual; clean lines, well balanced color work that will appeal to young readers and great facial expressions! A joy to read. This book intrigued me-I love that it is available in English and Spanish which is so important for my students. It presents 3 different folktales using graphic novels which are a huge hit in my Library, but I am not sure that students will rush to check this book out. I liked that it included notes and told more about the history of the folktales. I am interested to see what my students think of it. This book has a collection of different folktales from Latin America. All of the stories inside are written with child friendly language and they all have great illustrations for them. Jamie hernández asks the readers hypothetical questions such as "what happens when a woman marries a mouse" and discusses the folklore behind these questions. The stories are numerous and very interesting for kids. This is a charming and colorful set of tales. There should be more than three! That's my only complaint. This is great for kids who love fairytales or fables, and adults, too. I heard of this book through my beloved former professor's recommendation on the Comics Alternative podcast, and I second her glowing review. I was so excited to read this. The three folktales in this graphic novel are fun, and two of them have female protagonists. The folktales are odd, but classics. One of them, the story of El Raton Perez is a classic that I grew up listening to as a child. This book is a fun, modern way of presenting this tales to a new generation. She slays the seven-headed dragon and saves the prince! Raton Perez falls into the soup reaching for the golden onion and only Dona Pepa thinks to rescue him! Tup, with the help of his new and pesky ant friends, plants the crops and saves the farm! Latin American folktales come to life in these delightfully illustrated graphic stories. Girl power! I loved the cute, quirky art and the notes at the end explaining the history behind the stories. Comics are such a great medium to retell old stories and make them relevant to a new generation of young readers. This book is a good read and a good way to get students engaged in reading. This book is also good for ELL students or other students from different cultures. It is very diverse and has a little bit of almost every culture in it. Good read. With easy to follow art and folktales I've never read or heard before, this will be easy to recommend. Good for early readers wanting a graphic novel and good for older readers wanting to broaden their folktale repertoire. Good for most. Super cute collection of three folktales with life lessons. My favorite was the first, because it depicts a female hero who is kind, brave, and independent. I wish this was longer and filled with even more stories! Jaime and his brother Gilbert Hernández often write together under the name "Los Bros Hernandez".